Be the first to share your favorite memory, photo or story of Anthony "Tony". This memorial page is dedicated for family, friends and future generations to celebrate the life of their loved one. 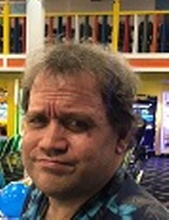 MONT, Anthony L. 'Tony" - Age 49, of Grand Blanc, passed away February 1, 2019. Funeral arrangements handled by Sharp Funeral Home and Cremation Center 6063 Fenton Road, Flint. Memorial Contributions may be directed to the family. Anthony was born May 22, 1969 in Flint the son of Ramon L. and Nancy (Nelson) Mont. He attend Mott C.C. Anthony was employed as a bus driver with MTA. Surviving: his dear brother, Ramon (Michelle) Mont; his loving service dog, Diego; and several loved ones. Anthony was preceded in death by his parents. Online tributes may be shared at www.sharpfuneralhomes.com. To send flowers or a remembrance gift to the family of Anthony "Tony" L. Mont, please visit our Tribute Store. "Email Address" would like to share the life celebration of Anthony "Tony" L. Mont. Click on the "link" to go to share a favorite memory or leave a condolence message for the family.